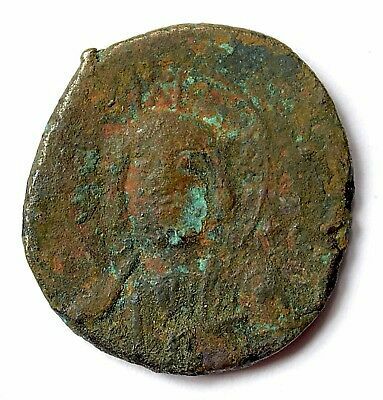 Seller: frascatius (16,847) 100%, Location: Saint Paul, Minnesota, Ships to: Worldwide, Item: 352614969604 13W18 FRASCATIUS ANCIENTS A BEAUTIFUL ANONYMOUS BRONZE FOLLIS MINTED IN THE REIGN OF JOHN I TZIMISCES FROM 969 - 976 AD . 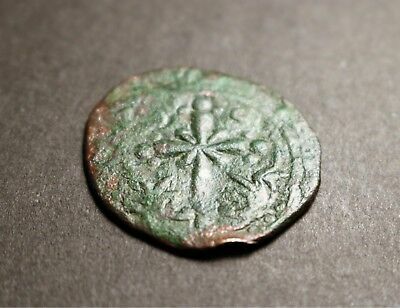 SEAR CLASS A FOLLIS John I strengthened the empire by coupling diplomatic skill with military strength. THE SIZE IS 31.7 MM AND 10.54 GRAMS. 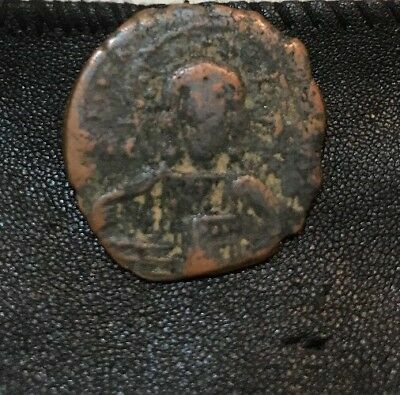 Sear 1793 OBVERSE – Nimbate bust of Christ Emmanuel facing, holding book of the Gospels REVERSE – IhSuS / KRISTuS / bASILEu / bASILE (Jesus Christ, King of Kings) in four lines John I Tzimisces, (born 925—died Jan. 10, 976, Constantinople), Byzantine emperor (969–976) whose extension of Byzantine influence into the Balkans and Syria and maintenance of domestic tranquillity assured the prestige and stability of the empire for his immediate successors. Descended from an aristocratic Armenian family, John was related through his mother to the general, and later emperor, Nicephorus II Phocas. He entered the imperial army and fought with Nicephorus against the Arabs in Cilicia and Syria. Having helped Nicephorus gain the throne, he was rewarded with the supreme command of Byzantine forces in the East. His ambition for the throne later led him into the conspiracy with his mistress, Theophano (the Emperor’s wife), that led to the assassination of Nicephorus in December 969. Forced to do penance by Polyeuctus, patriarch of Constantinople, in order to receive the imperial crown, John banished Theophano to a convent and punished the murderers. John I strengthened the empire by coupling diplomatic skill with military strength. In 970 he married Theodora, sister of Constantine VII Porphyrogenitus, the legitimate claimant to the throne, to offset challenges to his rule at home. When the Bulgars attacked the empire in 971, he led his forces against their capital, captured their tsar, and forced them to recognize Byzantine suzerainty. In July 971 he defeated the Russian prince Svyatoslav, ending threats to Byzantine rule in the north. To preserve the Byzantine position in the West, he arranged a marriage between one of his relatives and the future Holy Roman emperor Otto II. Turning to the East, he reduced the Fāṭimid strength around Antioch in 974–975, taking Antioch, Damascus, and other cities in Syria. Before he could retake Jerusalem he died, probably of typhoid. A True Auction Environment – Auctions start at $.99 with No Minimums and No Reserves. FULL UNCONDITIONAL GUARANTEE OF AUTHENTICITY If the buyer feels that the coin received is not as represented - just return the coin and the buyer will be fully reimbursed for the cost of the coin; the original shipping charge; and the cost to ship the coin back… No Questions Asked. If the buyer is not happy, please let me know, and I will do what I can to make it right. NOTE: Frascatius is a life member (LM #6864) of the American Numismatic Association (ANA). Frascatius fully complies with the ANA Member Code of Ethics. If you have any questions regarding this auction, please click on “Ask seller a question”. I will be more than happy to provide you with a response. 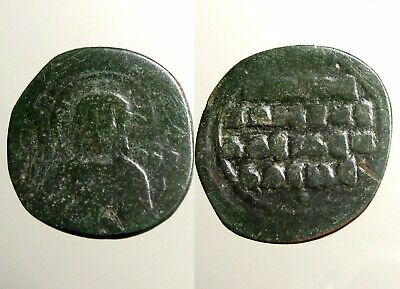 VISIT MY EBAY STORE: FRASCATIUS ANCIENT COINS For those new to ancient coins, please contact me, and I will e-mail to you my "Beginners Guide for Ancient Coin Collectors - FAQ" . SHIPPING:To the U.S. = $3.00 Insured Flat RateInternational = $4.50 Insured Flat Rate Multiple items may be grouped at no additional charge at the above rates. All items will be carefully packaged, protected & insured (private insurance).